This little episode happened a few days ago, and I wanted to share it straight away, but by the time I got home I lost it. It didn’t seem to be that important any more. But something reminded me this morning about how we decide what is important in our lives. Yes, exactly like that, you decide.. and I made a decision to share it after all because I was left with a lovely lingering feeling of happiness, humility, satisfaction, all that just because I bought a cup of coffee for someone I’ll never meet. Something that almost wasn’t worth mentioning, that cost me £2.30, gave me so much satisfaction (much more than, ironically enough, the bag of Nespresso pods that I bought couple of hours before that and was holding in my hands). Someone, I hope, enjoyed that cup of coffee and that, that gesture make their day at least a little bit brighter. 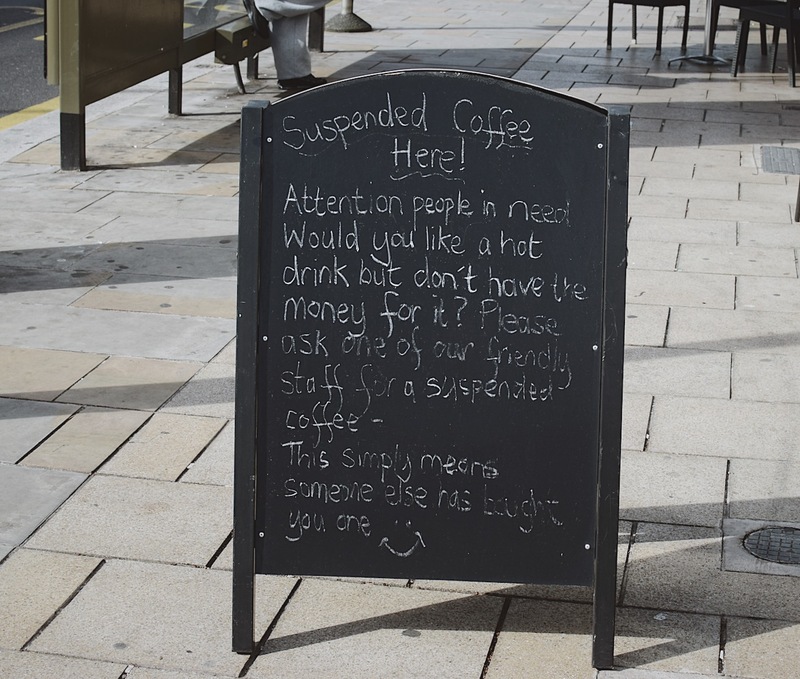 Mine was thanks to them, and that thoughtful sheme of suspended coffee moved me to a better place in life. The best part is that I was the twelfth person who did it that day in the Revival cafe at Bexleyheath, London.